A kettlebell exercise called the kettlebell swingThe kettlebell exercises.com website contains everything you need to know if you want to workout using kettlebells. The kettlebell exercises.com website contains everything you need to know if you want to workout using kettlebells. You'll find more than 30 exercises on this website. They are sorted by the main muscle group each exercise targets. Also, the exercises are presented using animations. The animations show the correct start position as well as the steps involved. To access the list of exercises, simply click on the menu items to the left. There are many benefits of having kettlebell exercises into your workout. First of all, our exercises require a few pieces of low cost equipment. Most of the exercises on this website only need access to a few kettlebells and nothing more. A large benefit of training with kettlebells is they are great at targeting core muscles. Core muscles are essential for stability and good posture. Core muscles may not be exercised when using fixed position equipment such as those found in gyms. 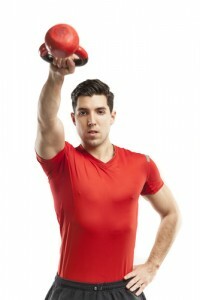 As well targeting core muscles, many kettlebell exercises give a complete all body workout. These exercises will require you to buy a few pieces of low cost gym equipment. All you will need are a few kettlebells of different weights, an exercise mat and you will be ready to go. Kettlebells range in weights and finishes. The ones you need will depend on your strength and the workout routines that you wish to perform. You may also wish to buy a kettlebell rack and suitable exercise mat. We have selected some suitable equipment for you to consider. As with any other type of exercises it is important to warm up before starting in demanding physical activity. Maintain proper posture when you use kettlebells. This means keeping your back straight or stopping your knees from locking down on most exercises. Focus on breathing properly. Being aware of one's breathing process is essential to getting good results with a kettlebell workout. What is the correct weight? Choosing the correct kettlebell weight can be difficult. This is because there are many variables such as your fitness and experience. Kettlebell training can be different from other forms of weight training such as lifting dumbbells. Some kettlebell exercises are very dynamic such as kettlebell swings, this makes them different than dumbbell exercises which are slower. Other exercises such as the kettlebell press are slow and controlled. The dynamic exercises can be done with a heavier weight than the slow, controlled exercises. Start your training with a light weight and perform the exercises in a controlled manner. This will help you determine what weight is appropriate. When you start your kettlebell training you may want to seek the help and advice of a fitness professional. Kettlebell Workout Clothing: One thing that many kettlebell users forget to consider is the clothing they wear. Flat soled shoes are better than running shoes because more of the sole is in contact with the ground. Flat soled shoes give you more grip and more surface area when you are driving upwards from your feet. Avoid loose clothing such as baggy shorts. These can be caught by your fingers or thumbs when doing exercises such as swings. Workout Area Some of the exercises take less room than a bench press. However, you will still need similar floor space. Ensure that nothing can be broken (mirrors etc) if you lost control of the kettlebell. The floor should be able to withstand the impact of dropping a kettlebell. The floor should have sufficient grip so that you do not slip. Kettlebell Storage: Kettlebells are very durable but as many of them are made from cast iron, they are prone to rust. Therefore, avoid storing them in damp places. If they are stored in a basement or garage, then place them on a mat so that they are not in direct contact with the floor. Fitness Health: Some kettlebell exercises can be intense. Consult with your medical doctor before starting these exercises. This is very true if you are new to exercising or if you haven't exercised them in a while. Remember, if you feel pain you should stop the exercises as soon as it is safe to do so. Kettlebells were originally created in Russia as a counterweight for weighing crops. They were originally called "girya" and it is believed they were developed in the 18th century. They were made in units and fractions of "pood", with one pood being the equivalent of 16.38 kg or 36.11 lbs. After spending ten years researching heavy weight lifting techniques, Dr. Vladislav Kraevsky supervised the opening of Russia's first weight training facility in August 1885. This facility used kettlebells along with other types of free weights. The first Russian national kettlebell championship took place in 1985. Russian fitness instructor Pavel Tsatouline worked with Dragon Door Publications from 1998 to 2001 to bring Russian Kettlebell training to North America. Tsatouline was primarily concerned with teaching people how to use kettlebells while Dragon Door Publications both manufactured kettlebells in the United States and published "The Russian Kettlebell challenge".